Rated 5 out of 5 by fatcatsssa from fun game fun game!,not to hard but hard enough,bought it, very fun keep up the good work Big Fish ! Rated 5 out of 5 by pennmom36 from Arrrr....TIS HARDER THAN IT LOOKS! What a cool game for kids AND adults. Those nasty skeleton pirates are after ye treasure held in the Captains quarters. You must strategically place cannons on the deck which is basically a grid with 6 rows and columns. 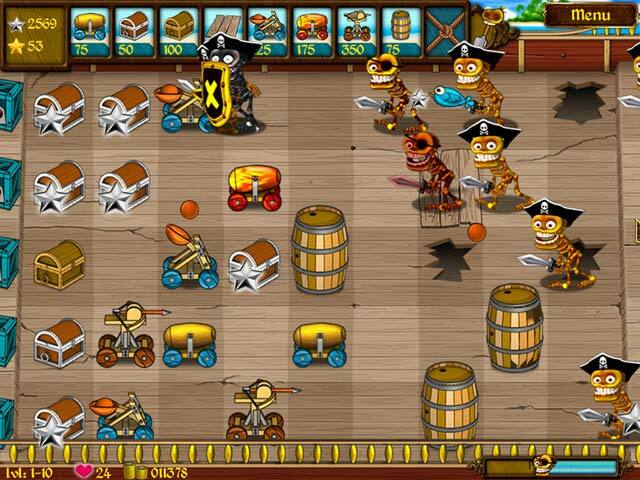 As the pirates attack try to slow them down with treasure chests that produce silver and gold stars which will be used to purchase more cannons or chests. Bluebirds will fly by and produce silver stars and canaries fly by producing gold stars but when the parrot flies by you must click on him to knock him out for extra lives. This game progresses quickly and is at a good pace. This is one of the few games that rank up there with Plants vs. Zombies so enjoy! 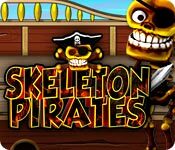 Rated 5 out of 5 by chiari_survivor from Where Dead Pirates seek Treasure! 5 star Awesome fun! Skeleton Pirates Where Dead Pirates seek treasure! Based on demo and purchase but not completed This game is awesome fun! Very similar to Plants vs Zombies as likely everyone is going to say, though this game is powered by Torque Garage Games, afb Games. Great Job developers! Music is catchy. The sounds & music are adj as is the full screen option. The various chests, cannons & weapons pulse throb to the music. Skeletons have beautiful smiles with nice white teeth, and they also bob to the music. The phrases the skeletons say are pirate appropriate, “Where’s the treasure”, “Blow me down” and “Yo ho ho”. Once the skeleton has taken their allotted damage they collapse into a pile of bones with one eye landing in the open month. Too hilarious. You sign in as the Captain of the ship and are safeguarding the treasure maps that the skeleton pirates are trying to get (instead of Zombies after your brains) To change players Click the Captain button along the lower center of the screen. There are spaces for 10 players. Options and Exit are lower right, Shop and Info are on the lower left. The info button explains, know your friends, know your weapons and know your enemies. Once you choose the weapon, enemy or friend the game shows you the details of that category by clicking the picture of what you would like more information about. Once an item is available you can then click to find out more about it but you can not see what future skills enemies may have in the future levels, or future weapons you will acquire. There are 40 slots for available inventory choices with rope X’s over the ones that are not available yet. The game only shows what items are currently unlocked. Beginning levels have 5 slots to choose your choice of weapons and later levels will have up to 9 slots open so there will be many choices to make once you have earned those items. You do start with only 3 lives and once you have earned enough coins the shop will open, I believe level 1-8 or 1-9 opened the shop for me. Purchasing an extra life, magic box, extra ammo or even extra slots for weapons will be available, as well as birds that will have an umbrella so they can fly in the rain. Once you pay for an upgrade it remains with you in future rounds. The information scrolls can be clicked faster if you read quickly and also are not too difficult for early readers to be reading. Additional information is overlaid over the bottom of the screen that can be easy to miss if you are focusing on your game play. The beginning levels start out very simple as they are the tutorial and quickly get more difficult. Level 1-1 you only have the cannon and the little blue bird flying through that will give you a silver star worth 25 points that gives you the funds to buy additional cannons. You do not have to click the blue bird to get the star and it will release its star at some point along the game board row it is flying in. If you miss seeing it or later the yellow bird drops the gold star, the stars will drop to the bottom of the game board and have stayed there or you can click on them while they are falling. I tested to see if it would disappear after a short time and they did not but I also am not sure that future levels may alter that. I was in level 1-9 when I was counting how many strikes a crate would handle (50)from that kind of skeleton and a skeleton takes 9 steps to cross a game square. Anyway, I had focused too much on that task of counting and had gotten behind adding needed cannons and the next surge the skeletons they were able to enter the Captains Chambers. There are even Parrots that help the skeleton Pirates. They fly through and drop their almost acid “business” that damages the crates, cannons and even the chests that give stars. Whacking the parrot gives you parrot heads and once you have achieved the number required on the level you are rewarded with a new tool. The beginning levels require 10 parrot heads. After whacking with a mallet that automatically appears when you click a parrot, the head goes to the inventory and his remaining feathers float down but no other parrot parts and is not gruesome. If you click the bird by accident nothing will happen and also if the bird and a parrot are at the same place when you click the parrot the bird will not be injured. There are many creative aspects making this game still feel similar to Plants vs Zombies but this game, can totally can totally stand on its own. I purchased with a PCC prior to even the demo hour completion. I was looking for a game for our grandson and have gotten pulled into it for myself also. I like that it starts out simple enough for beginning players though has quickly become entertaining for adults who also enjoyed PvsZ. I think this game I enjoy more, as sometimes the music and sounds in PvZ can stress me out with the impending sounds it has, and I have not felt that yet with this game (yet) but I am only in the 2-2 level now. 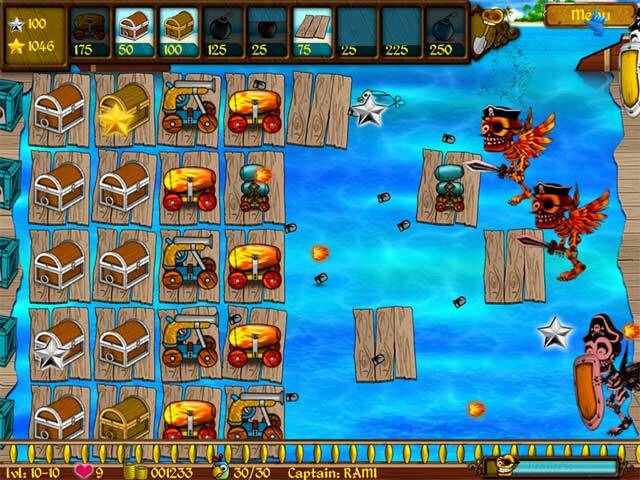 The first level had 9 or 10 pirate attacks. If you are loosing and back out of the game to start over it will cost you a life otherwise your game will be saved from where you were. I have had 3 times that while clicking it the game I popped out of the game but it had saved at the very spot so it was not a problem to just click continue game and go on but did want to at least make a mention of it. Give it a try it is awesome fun though the people who can not continue on in a casual mode may be disappointed. Rated 5 out of 5 by jackfaithsmom from Just like Plants vs. Zombies My favorite game by far is Plants vs. Zombies. The format of this game is almost identical, just with a different theme. It's a little more challenging because you have to collect stars not only to buy weapons against the skeleton pirates, but also to collect ammo. The new weapons you obtain aren't just given but you have to earn them by killing parrots that will attack your placed weapons. A great little strategy game and a must buy for me! Rated 5 out of 5 by calton from Like Plants vs Zombies Loved it! Finally another game like Plants vs Zombies! Instead of zombies, you have pirate skeletons who are on your ship trying to get to your treasure maps. You try to plant cannons and other weapons in their way by catching stars. You get the picture. Have fun! Rated 5 out of 5 by timbermoon from What would we have if Jack Sparrow were a game developer? Cannons vs. Pirates! This is quite clearly a PvZ clone. Is that a bad thing? Not in my opinion. I am a huge fan of PvZ, though - I freely admit it. Instead of trying to keep zombies out of your house, you are trying to keep skeleton pirates out of your ship cabin. Instead of peashooters, you have cannons. Instead of sunflowers making sun, you have birds bringing stars (which I can only conclude were plucked from the uniforms of military officials). The parallels are many and obvious. I appreciate that they didn't try to disguise that fact. The graphics are similar to PvZ's - cute and clear and bright. The game is easy to understand and fun to play. It offers a distraction to those waiting for PvZ 2 to be released. What's not to like? Rated 4 out of 5 by FeyKina from Very challenging by the end! Starts easy and gradually becomes quite difficult! I like a challenge. Wish there was a walkthrough for those later levels All in all it is highly playable. Rated 4 out of 5 by CajunWitch from Plants vs. Zombies Wanna-be It's a decent clone, but it definitely lacks the charm and humor of it's mentor. However, it's challenging, and I'm already planning to buy it. Rated 4 out of 5 by AvgSpock from A Decent Copycat of Plants vs Zobmies I have to admire the gumption of afb Games to take on such a beloved hit game as Plants vs Zombies and be willing to be compared to it. This game is certainly the first copycat that I have found to be worthy of such a comparison. In my opinion, they pulled it off, very well. It is obviously a well thought out game and it’s actually a solid runner up to its role model. 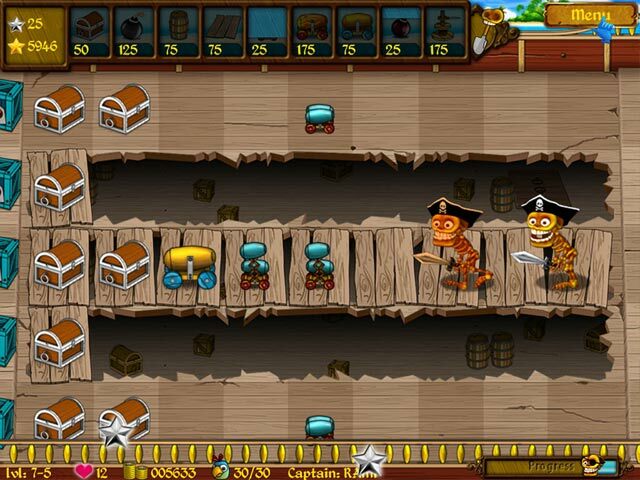 In this game you are trying to thwart skeleton pirates from stealing your treasure maps rather than protecting your brains. You use silver treasure chests that give you silver stars to collect in lieu of the sunflowers and a bluebird flying by also emits them. There are various cannon shooters and other artillery that is added on, after each level. You also get slots to fill and plan before the level begins. There is even a store for purchasing some items to help enable you to beat the levels although; of course it lacks Crazy Dave and his humor. My only criticism is that the short introductory tutorials are displayed so close to the bottom of the screen that I almost missed seeing them. I also missed a few when I got too click happy early on. I think that I would have preferred them to pop up in the center of the screen. For folks who have already played Plants vs Zombies, it will be fairly simple to figure out. It does have an info section available from the main menu that explains all of the characters and ammo to assist you in planning your strategies. They have added a few degrees of extra challenge within the levels such as; you have to re-arm your weapons with the help of a golden ammo chest complete with a golden bird companion that both emit gold stars and you also whack parrots to collect their heads. If you get all of them in a level you unlock a new weapon. The extra games are not accessible until completing the game so I can’t comment on how many of them there are yet. It also has an area called Rounds that is inaccessible as well. I’m not too sure what that is but, there do not appear to be any achievements as far as I have been able to tell. The music is catchy and the skeletons actually make sense when they speak. That is, if you speak Pirate. All in all, it’s an enjoyable day on the high seas. A hearty, “Ahoy Mateys” to the developers. Rated 4 out of 5 by ivillagegrinch from Plants vs Zombies clone It's cute, and will keep us entertained for a while until PvZ 2 comes out (which is taking their dear, sweet time, even though the characters were introduced at ComicCon in San San Diego! ), but it's just mindless summer fun. The strategy is the same, so you don't have to really plan anything out. It's worth using a game token on it. Rated 3 out of 5 by Janissi49 from Yes, just like PvZ, but not quite as good When I found this game, I was thrilled. PvZ is one of my all-time favorite games. I immediately downloaded and bought this game. Now, I'm kinda sorry I did. I had a lot of fun until I got to level 2.1 when the rain started. When the rain starts, the birds go away UNLESS you can afford to pay for them. Well, if you don't have enough money, you can't buy them. If you can't buy them, you have to earn enough stars simply by getting treasure chests and hoping they produce enough stars in order for you to get your weaponry. Well, I didn't have enough money for the birds, and it took WAY too long to gather enough stars, so I became discouraged and uninstalled the game. This game truly is fun and will keep you entertain, but make sure that you get as much money earned so you can purchase what you need at the store. If not, it's hard to win. Rated 3 out of 5 by CLUELESS35861 from Lame clone of Plants vs. Zombies Mediocre clone of Plants vs. Zombies, lacks the levels and supporting earned extras of PvZ. Had potential as a theme, but, released too soon. Rated 3 out of 5 by lininindy from Too HARD for me. I loved the game! But I couldn't get past level 1-7. :( I can't recommend this game to ALL. Rated 3 out of 5 by JadedBlonde from Plants vs. Zombies clone, with pirates My name is JadedBlonde and I am a Plants vs. Zombies addict. Hopelessly. That said, it is impossible to review this game without making PvZ references, as everything in this game has an exact part, title or feature that PvZ has. Exactly, down to even the set up of the playing field, the inventory, the catalog of weapons and the slots to place items you use for each round. This review is based on the entire demo. During that time I got to level 1-10. They don't give you a heck of a lot as far as info until you get going, so the beginning is mostly a tutorial as you're introduced to the weapons and features one at a time. It is slow going, so playing for an hour didn't make much of a dent in the game but is good to learn on. You have a ship and Zombie Pirate Skeletons are invading it, trying to steal your Stuff. What you have to work with - you need coins - gold ones and silver ones. Cute Little birds fly by at random times dropping coins to you which you collect (during the Daylight Round), and you buy chests to put on the deck which burp up gold or silver coins. Silver coins are your currency to buy items, gold coins buy your ammo - each time one of your weapons fires, you're deducted a gold coins. As far as I played, I had plenty at all times, though that might change in later levels. The silver coins go away at the end of the round; the gold coins accumulate and carry over. I ran into 4 types of Nasty Pirates during the trial that have varying levels of tenacity and endurance but it wasn't until the demo was almost over that you get a catalog to explain the traits of what you have so far. There is also a Pirate Parrot who also flys by at random times, dropping little bombs on your stuff, trying to destroy it. You hit him on the head with a mallet and then get his head. Yes, his head. When you collect 10 heads, you get a new weapon in the next round and Level "up" As with PvZ, you get to choose the weapons you want to use for each round, tailoring them to your level of play. There are, all told, 40 weapons, 13 types of Zombie Pirates and 2 Helper Birds. I assume from the screen shots there is a fog level, rain level, etc, just like PvZ. Other things you can choose to fight your battle are: planks to cover bomb holes that appear before some rounds; barrels or crates to block and slow the Skeletons as they walk; a shovel to dig up things you want to replace; a catapult, a cannon, a mini cannon, a bomb that blows up a 3x3 area. There is one song for the music which gets tedious fast. There's a progress bar at the bottom which shows how long each round is, but it lacks any indication of when a "wave" of skeletons is headed your way. The other thing I found really lacking was any indication as to how much damage you've done to each skeleton Thing- they walk towards your Stuff but you don't know if they are almost defeated, merely slightly wounded, or how much "life" they have in them yet. All of a sudden they just collapse, deader than dead, but you have no way to tell how the time is passing or battle is going. I think, makes it hard to plan where to place your things to reinforce or defeat them. I had to install this game twice, the first time it locked up solid. There were 2 little black "DOS" screens that loaded in the back and closed. Just mentioning this in case yo uhave a problem, it seems others are too so you might just want to try again if you do. The second time worked fine. This is a fun game, I'm sure many will like it. I am ruined by the ever-changing complexity and humor and levels of PvZ but this game is fun, and for sure worth a PCC or rainy day time passer. I would have given this game one more star but I'm not sure taking an awesome existing game, copying everything about it and making an exact clone merits getting overly excited about but it's nice to have another game in this genre. Rated 2 out of 5 by Deeisme from Skeleton Pirates Dead Game I bought this game a few days ago and I, already, want to get rid of it. I thought this would be a fun and cute game with all the beautiful colors, but it has turned out to be one of the hardest games I have ever played, in my life. There is no winning for the player because the Pirates keep destroying everything I put in their path. I can not, even get pass level one. I am going to see if Big Fish can give me a different game, because I sure can not play this one. Rated 2 out of 5 by carb7250 from Boring Didn't like this one. Visuals are cheesy, game isn't motivating, and it's boring. Rated 2 out of 5 by Trumangirl from Boring I almost fell asleep. soooo slow. Rated 2 out of 5 by dewieee from Lagging badly I really liked the game..was challenging but when I got to level 2-1 it lagged so badly I couldn't control my curser. Needless to say I kept losing because I couldn't do anything. Also the boxes that give you stars take forever. You just sit there waiting and waiting for a bird to fly over and give you a star to purchase ammon..oh but then, when it rains,the birds don't come out so you are left at the mercy of the boxes! Nice try but no...got a refund. Rated 2 out of 5 by mjhubal from boring! slow and boring. I quit on level 2! Rated 1 out of 5 by dirtybelly from save your money Let me sum it up for ya: you just lost your last life at level 10, surprise back to level 1 you go to start all over and replay all those levels again. yeah right screw that!!! Rated 1 out of 5 by LadyHood from Cursor turns to Jello! Finally a game that convinced me to post my first review - because it is so annoying! Loved the first level of Skeleton Pirates, but once you reach Level 2-1, I found that the cursor turns to Jello - all wobbly, hard to control, and with a significant time lag. I'm not sure if this is meant to be a "feature" relating to the rain on that level, or if it is a bug, but it means that it is impossible to place any new defences and to pick up the stars earned. It's seriously annoying to lose because the game has taken away your ability to use the controls. This game is a real waste of money - avoid! Rated 1 out of 5 by Menu7 from A Very Dumb Game This is one of the dumbest games I've seen...it's right up there with plants vs zombies. Both game formats are just plain awful!! The object is to protect your treasure from zombie pirates but you can't earn enough weapons in a timely fashion to do so. After you place the weapon, you just sit back and do nothing but watch it slowly kill the pirates. And I do mean slowly. No, really... slooooowly. I don't understand why this game got so many high marks and good reviews because it is absolutely low in challenge and has absolutely no fun factor at all. This game is a big yawner. Don't bother if you're looking for a fun challenge because you won't find it here.